The Dark Energy 120A Flashlight by SOG Specialty Knives & Tools has 120 lumens with a max run time of 5.7 hours on 1 AA battery. The flashlight has 5 operation modesfull brightness, 40%, reading mode, strobe and momentary on. The black body is hard anodized aluminum. 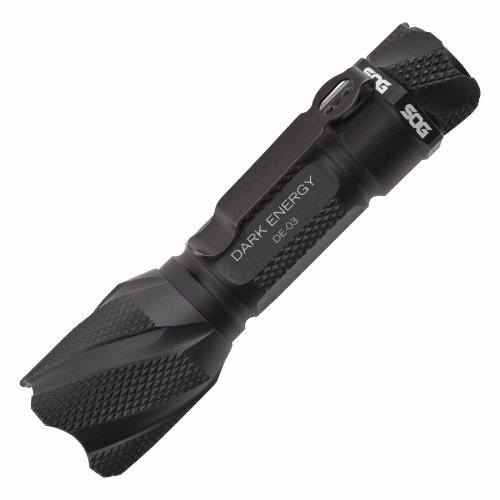 Like all SOG knives, the Dark Energy Flashlight has a lifetime warranty. Includes 1 AA battery. Features a Cool White Cree R5 LED bulb with a Optical Grade Polycarbonate Lens and Textured aluminum reflector. Max output of 128 lumens and a run time of 66 minutes on 100% brightness, or 67.3 hours on reading mode.